In case you missed it yesterday, Republicans in Congress were thrown into complete chaos when House Majority Leader Kevin McCarthy unexpectedly withdrew his name from the race for Speaker. Now, the race is on to find a replacement for outgoing Speaker John Boehner, who will stay in his current position until a new Speaker is elected. Utah Congressman Jason Chaffetz and Florida Rep. Daniel Webster are still in the race, but another candidate has emerged for the position. During an interview with MSNBC's Morning Joe Friday, former Oversight Committee Chairman Darrell Issa, who spoke to reporters yesterday immediately after McCarthy made his announcement about exiting the race, revealed he is mulling a bid for Speaker. "The fact is, yes, I think that I could potentially be a candidate. At the same time, I agree with the vast majority of members, I think. We need a Paul Ryan or we need somebody who is A.) experienced, B.) 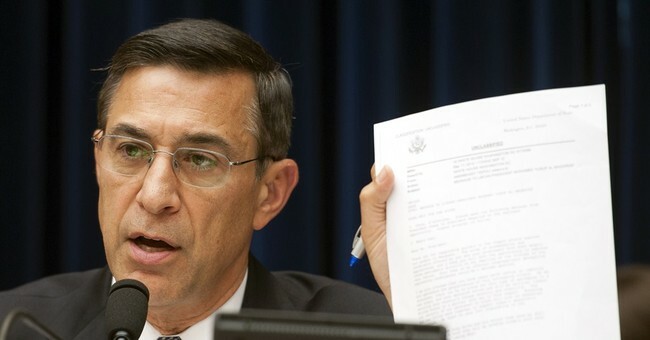 has been a Committee chairman or something other than just up through the leadership ranks," Issa said. "We very definitely need to pick our fights carefully, but we need somebody who is willing to do those fights, when the time comes, because the motion of our party has been to the right. The new members – the members since 2010 – they’re more conservative. They’re more interested in real fiscal reform. And they’ve been denied by the K Street, if you will, influence the ability to actually get votes that were fiscally responsible. We’ve had some tough votes." Issa also slammed Chaffetz, who took over the position as Oversight Chairman, for failing to continue holding government accountable and pointed out the Utah Congressman hasn't issued a single Committee report since taking over earlier this year. "Well, look, Jason’s a good man. An honorable man. But he got his job by going to Boehner and saying he would shut down that rancor that was going on. That he would “go along, get along.” And he’s done that. He put shining pictures of Utah on the wall and he basically stopped doing it. There hasn’t been a single Committee report or staff report published since he’s been chairman. The fact is, he’s a good guy, but whatever he was as a freshman, when he was a fighter on our Committee, when he was trying to hold government accountable, he took a break from that. And I think that’s going to hurt him. Not whether I get into the race or not. It’s already hurt him. He didn’t have thirty votes going into the race. I don’t think he’s going to get the 240. But, let’s understand something. I wouldn’t have the hubris to determine whether I’m the 240 candidate or Paul Ryan," Issa said. "This is something where the conference has to dig deep. They have to ask the question, “Who can we unite behind?” This is a job that you can’t run for. You can make yourself available for it. But the conference really has to look hard. Not for who’s got the most whips calling, but who can really make a difference beyond 218. Because the day after you’re speaker, you have to make hard decisions and, like Joe said earlier, you have to be able to go to people and say, “I promise to bring up your issue, but I need you to do this for me now,” and you’ve got to keep those promises. And that was one of those areas that Boehner ran out of the ability to get people to say yes to." During his time as Oversight Chairman, Issa led the charge to investigate a number of Obama administration scandals including Operation Fast and Furious, Benghazi, the IRS targeting of conservatives and more. Yesterday Speaker Boehner said he was confident a new Speaker would be selected within coming weeks, but a date for a vote has not been set.